Khosrow Moslehi received his PhD from the University of California at Berkeley. He is the Director of Product Management at ABB/Ventyx in Santa Clara, California. 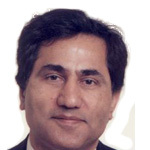 Dr. Moslehi has extensive experience in R&D in smart grid, electricity markets, power system analysis and optimization, and system integration and architecture.